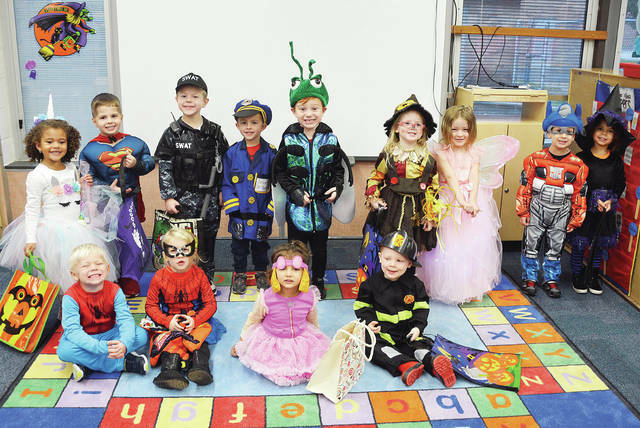 Children from the Four County Career Center Preschool in Archbold went trick-or-treating through the school on Halloween, gathering candy and goodies from the staff. Pictured are - front, from left - Zachary Norden of Napoleon, Kennedy Blue of Holgate, Camila Zetter of Toledo, Dylan Boyer of Wauseon - back from left - Laiklin Evers of Napoleon, Zane Reed of Napoleon, Jordan Inkrott of Delta, Micah Helberg of Napoleon, Blake Schroeder of Bryan, Isabella Schoonover of Defiance, Elowyn Custer of Wauseon, Brennan Vancock of Delta, and Giuliana Zetter of Toledo. Children from the Four County Career Center Preschool in Archbold went trick-or-treating through the school on Halloween, gathering candy and goodies from the staff. Pictured are – front, from left – Zachary Norden of Napoleon, Kennedy Blue of Holgate, Camila Zetter of Toledo, Dylan Boyer of Wauseon – back from left – Laiklin Evers of Napoleon, Zane Reed of Napoleon, Jordan Inkrott of Delta, Micah Helberg of Napoleon, Blake Schroeder of Bryan, Isabella Schoonover of Defiance, Elowyn Custer of Wauseon, Brennan Vancock of Delta, and Giuliana Zetter of Toledo. https://www.fcnews.org/wp-content/uploads/sites/45/2018/11/web1_trick-or-treat.jpgChildren from the Four County Career Center Preschool in Archbold went trick-or-treating through the school on Halloween, gathering candy and goodies from the staff. Pictured are – front, from left – Zachary Norden of Napoleon, Kennedy Blue of Holgate, Camila Zetter of Toledo, Dylan Boyer of Wauseon – back from left – Laiklin Evers of Napoleon, Zane Reed of Napoleon, Jordan Inkrott of Delta, Micah Helberg of Napoleon, Blake Schroeder of Bryan, Isabella Schoonover of Defiance, Elowyn Custer of Wauseon, Brennan Vancock of Delta, and Giuliana Zetter of Toledo.